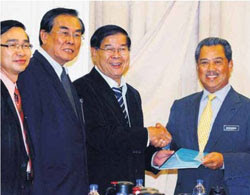 LAST Tuesday, Deputy Prime Minister and Education Minister Tan Sri Muhyiddin Yassin met seven Chinese educationist groups who want the teaching of Mathematics and Science in Chinese primary schools to be reverted to the Chinese language. The Chinese educationists have been rather unhappy since the English for Teaching Mathematics and Science (ETeMS) policy was first announced by the former prime minister, Tun Dr Mahathir Mohamad, on May 10, 2002. To them, there is no valid reason for the implementation of ETeMS to be extended to Chinese primary schools when the first switch from teaching Maths and Science in English to Bahasa Malaysia in the late 1970s involved only the national schools. The Chinese educationists have many reasons for opposing ETeMS, but to my mind, their main concern is actually this. If the two subjects are taught in English, that spells the beginning of the end of Chinese primary schools in this country. Apart from China, Taiwan and Hong Kong, Malaysia is the only other country which has the Chinese language as the medium of instruction in Chinese primary schools. They suspect that if the ETeMS policy is implemented, there would come a day when non-Chinese-educated teachers will be roped in to teach Maths and Science in English in Chinese primary schools, thereby changing the character of the schools. To them, this is an insidious attempt to do away with vernacular Chinese schools in this country. To a certain extent, such a fear is not unfounded. Before independence, the British administrators in the 1951 Barnes Report had wanted to abolish the vernacular schools. Then the 1960 Abdul Rahman Talib Report also brought about the new Education Act 1961, which contained the infamous Section 21(2) (now repealed) empowering the minister to convert any national-type vernacular primary school to a national primary school. To the Chinese, education is the issue most dear to their hearts. It often evokes strong emotion and passion in the Chinese community, and it is said that any political party which attends to the educational needs of the community will win their hearts and minds. Likewise, any Chinese- based political party which advocates the closure of these schools will only be committing political suicide. Today, more than 90 per cent of Chinese pupils study in Chinese primary schools, and close to 90 per cent of them also move on to national secondary schools after their primary education. But what the educationists and Chinese-based political parties have failed to address since independence is the high drop-out rate among Chinese youths who are unable to cope with the switch to English or Bahasa Malaysia at the national secondary schools. Hundreds of thousands of them also cease having further education after Form 5 due to their poor academic performance. As a result, many of them end up with blue-collar jobs. While it is novel that Chinese children in this country get to learn about their heritage and culture at primary school, it is really a sad thing if later thousands of them are unable to cope with their studies at the national secondary schools. They must realise that having a good command of the Chinese language is not sufficient in this globalised world. This is evident in China these days where millions of youths are trying all sorts of ways to learn and become proficient in the English language. In my opinion, learning Maths and Science in English in primary schools will help those pupils who later switch to national secondary schools. It also increases their proficiency in English because, for example, if the students end up in the Science stream, they will be studying most of the subjects in English as all the Maths and Science subjects -- General Maths, Additional Maths, General Science, Chemistry, Physics and Biology are taught in English. If they take only Maths and Science subjects in Form 6, they are as good as studying in an English school. This also makes the acquisition of knowledge in these subjects easier. As I said before in this column, many of our Form Five students will not even be able to answer the English language paper of the Singapore Primary School Leaving Examinations (PSLE). Today, that is the exact state of English proficiency among our young. Indeed, I have met many young Chinese teenagers who cannot comprehend or read a simple passage in English. Already, most of them think in Mandarin before they form any sentences in English. It is therefore not uncommon to hear sentences like, "You eat what?" or Ni chi shen me in Chinese instead of "What are you eating?" or "I never eat until" or Wo hai mei you chi dao instead of "I haven't eaten it yet". I am not advocating the closure of these schools. But with the government's assurance that these schools will stay, the Chinese educationists should at least consider ETeMS favourably since six years in the vernacular schools will make the pupils proficient in their mother tongue, and this should really be the main purpose of vernacular schools anyway. Similarly, this policy must be divorced from the implementation problems which I believe are surmountable if we have the will to carry it out. As a start, with ETeMS, Remove classes should be abolished altogether. Another way is to shorten the duration of secondary education to allow those who excel in UPSR to sit for SPM when they reach Form 4. Those who are slower can spend an extra year to take the SPM examination when they reach Form 5. All in all, our education system must not be allowed to progress at the pace of the slowest learners if we want to be competitive.